It used to be that all-in-one printers were prohibitively priced for most of us. Granted, that was a while ago, but they are still getting more affordable all the time. I have much more than basic printing needs, because I’m always copying worksheet masters and various other things for homeschooling. But my laser printer won’t print from any of my portable devices. This is occasionally a problem. I’d heard of printers that would print with Apple AirPrint, but there are also other ways to print from portable devices. Using the Epson WF-3540 is one such way. It will print while physically connected to a computer, or over your home Wi-Fi. 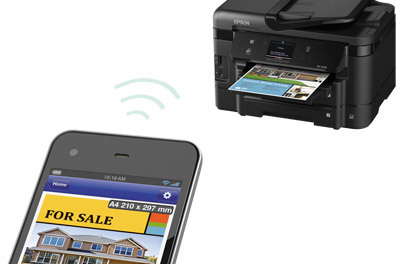 But it will also connect through Google Cloud Print and Epson Connect, and also supports Apple AirPrint. When I got the printer, it was very easy to set up for printing from a computer that was physically connected to my home network. I didn’t even need the suggested (but not included) USB cable. We just followed the directions, and voila, we were printing. Setting up to print from my iPad was less straight forward. We chose to set up Google Cloud Print, whose setup information was slightly difficult to follow, but it was all contained in the User’s Guide. After many starts and stops, we finally found the right help screens that guided us through the steps. The steps included determining our IP address (I don’t have a static IP, though, so I imagine we’ll have to set this up on a regular basis), typing the IP address in the address bar in a browser, and following the instructions. You have to link the printer to a Google account. Once we got it set up, though, it worked beautifully, and I successfully printed from my iPad and my iPhone. Now I can print anything from my DropBox folders on the fly, and from many, many other applications. This is going to come in handy frequently. On other printers, such as my laser and the last ink jet I had, printing in draft mode did a pretty good job. We found that draft mode with this printer, though, left white lines through everything. You could still read it, but it was distracting. We’ve taken to printing in standard mode for even just plain text. It also seems to underperform in gray scale, with lines of white sometimes showing up even in standard mode. So we tend to leave it on Standard Color for printing anything important, with the Text and Graphics Density setting. One really cool feature that I’d never had any experience with is automatic two-sided printing. Using it is so much better than the usual odd page printing, then even page printing, hoping that you get the pages lined up correctly when you put them back in the paper tray. The only problem we found with that, though, is that it leaves some ink on the corner of the page, since there isn’t enough default dry time before it flips the page over. You can change the settings to add in extra dry time, though. The printer will also do two-sided copying, scanning, and, for those of you who still have a need for it, faxing. The Automatic Document Feeder can handle up to 30 letter-sized pages for those functions. We found that color copying looks very good, with the color turning out pretty true to real life. It’s not exact, but it does give much truer color than my color laser printer (a Samsung CLX-3175FW). The printer also has several scanning modes in the included scanning software. You can also scan and save documents in DropBox, Evernote, or other locations. The printer has a touch screen to access the menus, and you can use gestures to navigate. There are two front printing trays, so you can store your regular paper in one, and something special in the other, such as envelopes, photo paper, labels, or a different sized paper. The ink cartridges are individual, so you only need to replace the ones you use up. The ink is DURABrite Ultra ink, which is supposed to dry very quickly, not smudge or fade, and be water-resistant. The Epson WF-3540 retails for $199, but can be found cheaper. Check out the Epson website for more information about this printer. While it claims to have “blazing” speed, I found that it’s just a good, fast, versatile printer. I recommend it to anyone looking for an inkjet all-in-one, especially one that can be printed to from wireless devices. Note: I received a printer unit for the purposes of this review.